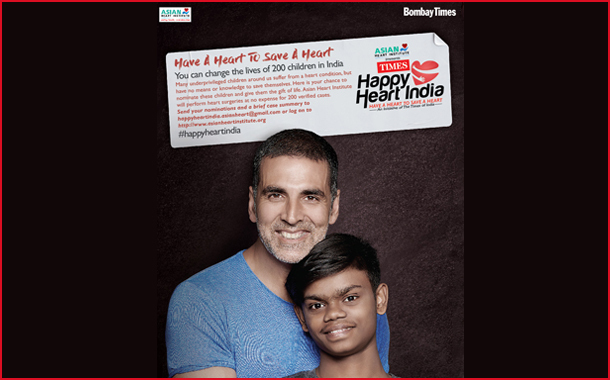 Mumbai: The Times of India in collaboration with Asian Heart Institute launched the #HappyHeartIndia campaign. Akshay Kumar launched the campaign on 7thApril, the World Health Day, that aims to shed light on the nation’s growing heart disease problem. The campaign #HappyHeartIndia is built around multiple content pillars through interviews that will amplify the importance of inculcating healthy heart habits in our daily lives via a 3-month long engagement across print and digital. The campaign will also run inspirational stories and fun contests to engage readers as it promotes the importance of and ways to maintain a healthy heart.